A Subway Station by Any Other Name Would Still Smell As, Hey, What IS That Smell, Anyway? Last week I came across an anagram system map of the Massachusetts Bay Transportation Authority (MBTA), in which station names were reassembled into new words. Alewife becomes "Eel Waif", for example, and Prudential becomes "Tidal Prune". While I found it highly amusing, I didn't see much use for it on the blog immediately and filed it away for later use. Lo and behold the Boston Globe reports today that the Boston Public Library has been angling to get the Copley Station name changed to add "BPL" or "Boston Public Library". The anagram map indicates that the name should really be "Ye Clop" but I suppose the other two names would work in a pinch. I understand the Boston Public Library's position on adding their name to Copley Station: improved wayfinding has always been an issue in Boston, but I am going to side with the MBTA, which is worried about the cost and logistics of implementing a name change. The business of naming a T station should be a regularly scheduled process, not an ad hoc legislative solution (although in fairness, I do already have a station named after me). With new stations coming online along the Fairmount (or Indigo Line) commuter rail line and stations being refitted for handicapped access, there would appear to be a number of changes coming to the MBTA system map. Rather than approaching this piecemeal by creating a name change for a single station, the T should be allowed to conduct a regular schedule of system map updates, with the opening of the new commuter rail stations a perfect opportunity to fold in a name change to add "Boston Public Library" to the Copley Station name. In addition, there should be a public comment period for other name changes: Emerson probably should be added to Boylston Station, for example. 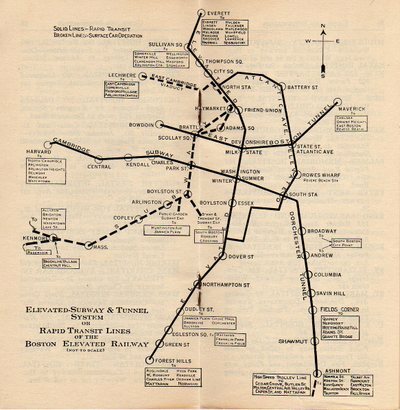 I've included a 1934 Boston Elevated Railway system map which shows how durable some station names have been. The only change along the Red Line, except for the addition of new stations, was Summer/Winter Station becoming Downtown Crossing. Other parts of the system have disappeared: the elevated Orange Line along Washington Street (you can read about Dudley Station here) was removed in the 1980s, with Silver Line replacement service now running (a subway to Roxbury never came to fruition). The Atlantic Avenue elevated is gone as well but to my mind a light rail replacement would be a welcome addition to the Rose Kennedy Greenway. "What literary advantages have the mass of our citizens derived from the Athenaeum? Who gets a peep within its lofty walls without a ten-dollar bill? And what genius owes its expansion to the liberal facilities of the Boston Athenaeum ? When the poor are favored with admission to study the neatly fitted up shelves. of books which adorn the Athenaeum, we shall be convinced of the necessity as well as worth of it, and not before. Things are becoming quite royal in our venerable old city: money buys a ticket for the wealthy to read the Hebrew language, while the industrious, worthy portion of the community, may intellectually starve." I bet you didn't realize the City Record was that old, did you? Times have changed however, and your humble editor is a member of that august institution now. You can also become a member, or, if you're intellectually curious, visit Acquired Tastes: 200 Years of Collecting for the Boston Athenaeum through 13 July 2007. You will see treasures ranging from a copy of Thomas Paine's Common Sense from George Washington's personal library, rare Boston maps and photographs, a copy of the Emancipation Proclamation signed by Abraham Lincoln, paintings by Allan Rohan Crite, Paul Revere's Boston Massacre broadside, and many other things which will delight and stimulate the imagination. Best of all, you don't need a ten dollar bill to see it: the exhibition is free and open to the public, but only through 13 July 2007. The Boston Athenaeum is located at 10 1/2 Beacon Street, just steps from the State House and the hours are 9-8 on Monday, and 9-5 Tuesday through Friday. Tell them the City Record and Boston News-Letter sent you. "If the essence of history is the memory of things said and done, then it is obvious that every normal person, Mr. Everyman, knows some history." Carl Becker, 1931. But what exactly is the nature of the history people know? I've recently noticed several instances of historical claims being made with little justification. J. L Bell has been observing Framingham with a close eye, the Boston Globe examined the oldest house claims of the Fairbanks House in Dedham and the Balch House in Beverly, while I have found yet another misleading claim about the origins of public education in this country, among other historical problems. Jay Fitzgerald nails it, albeit on a different subject: we're in the "Worst Historical Analogies Ever War". "It is ordered that the 20th of May 1639, that there shalbe a rent paid of 20ls yeerely foreur imposed upon Tomsons Iland to bee payd p euy p'son that hat p'prtie in the said Iland according to the p'portion that any such p'son shall fro tyme to tyem injoy and posesse there, and this towards the mayntenance of a schoole in Dorchestr this rent of 20ls yeerlyl to bee payd to such a schoolemaster as shall undertake to teach english latin and other tongues and also writing...."
It is pretty simple really: the oldest public school is Boston Latin School which was created by the town of Boston in 1635, although students had to pay to attend, the oldest free public school was created in Dorchester, and then there are the pretenders like Dedham and Rehoboth. When the Globe addressed the origins of public education last year, I wrote a letter to the Globe trying to clear up the mystery. I see it didn't stick. As to the title of this post, I refer readers to Carl Becker's 1931 presidential address to the American Historical Association. It is well worth reading. Mount Auburn Cemetery presents final lecture in the "Facets of Mount Auburn: Celebrating 175 Year of a Boston Jewel" series will be held on 15 May 2007 at 6 P.M. in the Rabb Lecture Hall at the main branch of the Boston Public Library in Copley Square. Dr. Charles Beveridge and Arleyn Levee will present "The Cemetery and the Park: Nature, The Designed Landscape, and Urban Planning". Space is limited and registration is requested. Please call 617-607-1995 or visit www.mountauburn.org to register. First Parish Church in Dorchester will hold its 377th anniversary service tomorrow, 25 March, at 11 A.M. and the public is invited to attend. First Parish in Dorchester was founded in Plymouth, England, on 20 March 1630 and the congregation landed in America in early June, 1630, an occasion marked by the Dorchester Day Parade. More information about the history of First Parish can be found here and here. "Wherever it had been found necessary to erect large secular edifices, they have either been entirely destitute of ornament, and belonging to no order of architecture, or slightly adorned with Grecian cornices and pilasters. Instances of this architecture appear all over the country; but we do not recollect any that are more illustrative of what we mean, than most of the College buildings at Cambridge, New England. We would cite these as very perfect specimens of no known order of architecture; vast brick barns, destitute alike of symmetry, ornament, and taste; and with all their plain and uncouth proportions, there is a sort of horrible regularity and squareness about them , which heightens their deformity. Four of these edicfces are guiltless of any attempt at elegance of architecture, and, making no pretensions. perhaps hardly deserve to be noticed. But what shall we say of the stone edifice, which insults us with its long piazza, and its wooden Ionic pilasters, and the entablature which extends part way across the front? The proportions of this wonderful building are about one hundred feet by forty or fifty; at the ends, it is three stories high, with basement rooms; the sides are partly two stories and partly three stories high, the great expanse of wall being somewhat relieved by the pilasters and entablature. The chef d'oeuvre of the whole building, however, is the piazza or portico, which runs along part of the western side or front. it is approached by a lofty flight of stone steps guarded by an iron balustrade; nine columns, from twelve to fifteen feet high, each a single block of granite, and surmounted by a Tuscan capital of soap-stone, are ranged along the front of the piazza, and support a flat roof eight inches thick, and so light and insignificant that is seems as if a breath of wind would blow it away. We doubt whether the world contains any other architectural abortion, to be compared to this." But what really caught my eye in the statement above was this: "We would cite these as very perfect specimens of no known order of architecture; vast brick barns, destitute alike of symmetry, ornament, and taste; and with all their plain and uncouth proportions, there is a sort of horrible regularity and squareness about them , which heightens their deformity." It's as if those who criticize One Western Avenue today are channeling George Cleveland. Is One Western Avenue really that bad? Acquired Tastes: 200 Years of Collecting for the Boston Athenaeum has opened for public viewing. On display will be numerous books, sculptures, paintings, and other items acquired by the Athenaeum over the years, many of which are rarely seen by the public. I haven't seen the show yet but will give an in depth report after I do. The Boston Athenaeum is located at 10 1/2 Beacon Street in downtown Boston, near Boston Common and the Statehouse. Admission is free and the exhibition is open Monday through Friday, 9-5:30, and on Saturday from 9-4. The exhibition will run through 13 July 2007. I took the following pictures this morning at the James Blake House on Columbia Road in Dorchester. The Blake House is the oldest house in Boston and was constructed c. 1648. These provide a rare look into the construction methods used to build a 17th century house in the English west country style. You can see the renovation of an English house built between 1550 and 1630 here. It was built in West Sussex, which is not quite as far west as where the settlers of Dorchester came from. Still, the photos should give you some sense of how the Blake house was built. 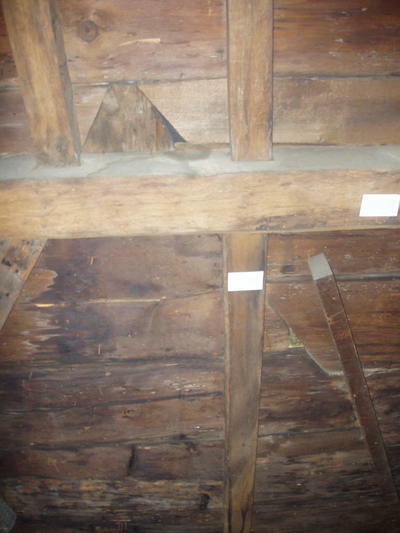 The wattle and daub was used to fill in spaces between framing timber and you can still see the 17th century plant material sticking out in places. What you can't see are the animal hairs, human, hair, and 17th century textile fragments which have also been found in it. In this picture you can see a triangular cut in the roof sheathing, which is where an old gable window projected from the roof. The Blake House has undergone numerous alterations to bring it into line with current architectural fashions--this window was likely removed by 1800. When the Blake House was renovated and restored in 1896 after being moved about 1200 feet from its original site, some recycled wood found its way into the sheathing. Notice the wallpaper still attached to the board just under the window. The diamond pane windows are from the 1896 renovation which was done in an Arts and Crafts style. 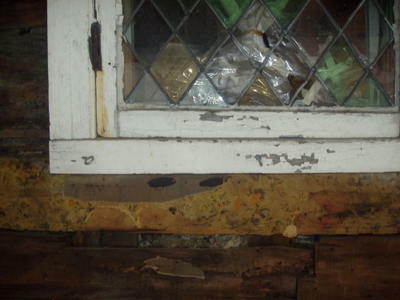 All of the leaded glass windows will be removed from the Blake House and restored. 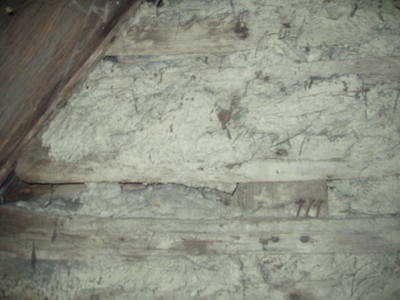 An important part of the current restoration plan is to preserve as much of the original fabric of the Blake House as possible. 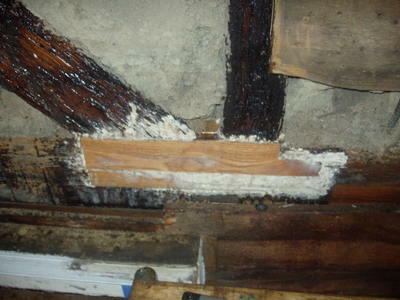 In cases where the original wood is badly deteriorated, new wood of the same species replaces rotted wood and epoxy is used to conserve and strengthen wood that is damaged. If this house had been built in England, the exterior would likely have looked like this picture, a classic half-timber look. 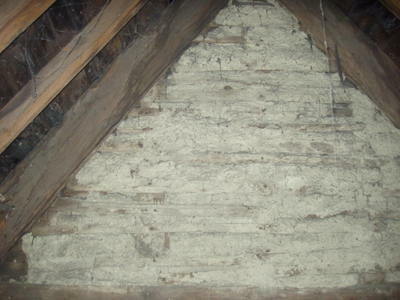 The New England climate proved harsher however, which meant that the frame and wattle and daub had to be covered for durability and warmth. Dorchester Historical Society President Earl Taylor and preservation architect John Goff will be presenting an illustrated program "Dorchester from the Period of Settlement (1630) to Annexation (1870) on Sunday, 18 February 2007 at 2 P.M. The talk will be held at the DHS headquarters in the William Clapp House, 195 Boston Street, Dorchester. A map showing the location of the William Clapp House can be found here. 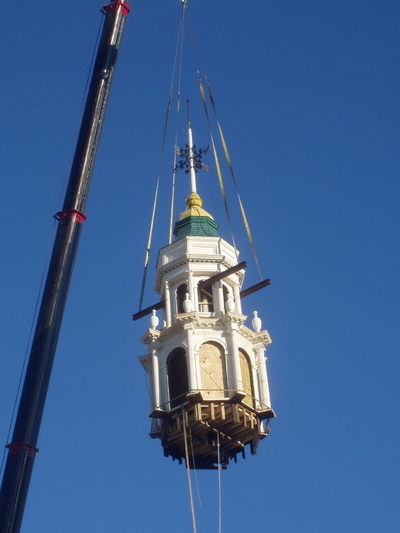 The lantern has been removed from the steeple of First Parish Church in Dorchester. You can read the Boston Globe story (which doesn't quote me) the Boston Herald story (which does), or view a small photo album. I also showed up on New England Cable News and Fox25 news and will have to see about getting the video--I'm sure you're all dying to know what I look and sound like. More photos will be added soon, as well as video of the lantern being removed. If you would like to know how you can contribute to the restoration of this Dorchester landmark, please email me. I'd like to thank everyone who came out to watch the lantern be removed. Watch this space for the announcement of the opening of the time capsule.